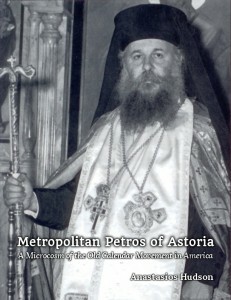 My book, Metropolitan Petros: A Microcosm of the Old Calendar Church in America will be released as an ebook and in print-on-demand format this week, God-willing. I am putting together the final edits and formatting to meet the various publishers’ requirements. In the meantime, here is an excerpt of the work, the Preface to the Published Edition. Please stay tuned, and plan to purchase your copy, which will help raise awareness of this monumental figure, and help support my writing career and family! The first time that I visited the Cathedral of Saint Markella was during Lent of 2004, after I dropped someone off at nearby La Guardia airport. On my way back, on a whim, I decided to stop in, after having read about this Church and its people—the Greek Old Calendarist Orthodox Christians—for several years. Tucked away on a sleepy Astoria street sits this modest-sized cathedral, which was founded in 1954 by Metropolitan Petros of blessed memory, who came to America after suffering through the persecutions directed against the Old Calendarists in Greece from 1924 on, after they had refused to go along with the change in the Orthodox festal calendar introduced that year. I was a seminarian at St. Vladimir’s Orthodox Theological Seminary in nearby Yonkers, New York, having arrived there in the summer of 2002. I was not Orthodox at the time, but rather an Eastern-Rite Catholic, and part of the reason I had enrolled in the seminary was to learn as much as I could about the Orthodox Church, in order to discern whether to remain Catholic or become Orthodox. It was not long before I decided to become Orthodox, but I noticed differences between the modern presentation of Orthodoxy and what was being described in the ancient texts we were studying. I also grew concerned with how Orthodox participation in the Ecumenical Movement might be negatively impacting the missionary activity of the Orthodox Church. I was always aware of and appreciated the small but vocal traditionalist element in the Orthodox Church, which I had become familiar with as early on as I had discovered Orthodox Christianity itself, but I doubted whether the issues I was having were serious enough to lead me to join an Old Calendarist Church, or whether I should just join one of the “mainstream” jurisdictions in America and be an advocate for traditionalism “from within,” as many were encouraging me to do. This is what I was wrestling with that April evening ten years ago when I decided to pay a visit to St. Markella’s. Stepping into the cathedral, I was struck with a peaceful feeling. The hymn “God is with us” from Great Compline was being chanted by a monk and a nun alternatively while a priest served, and there were a few people in attendance, but not a crowd. Still, the fact that there was a church that was open all day every day where people could just stop in and pray, with services that had been going on daily since 1954, made a strong impact on me. I left at the conclusion of the service, without having spoken to anyone, but feeling convicted of a need to take these people and their claims seriously. A few months later, I returned to the cathedral to speak first with Bishop Christodoulos and later with Metropolitan Pavlos, the grandnephew of Metropolitan Petros; and after an afternoon spent with them, I felt called to join the Church of the Genuine Orthodox Christians, but I took the process slowly. I was still enrolled in the Seminary, and didn’t want to cause any unnecessary conflict. There were also personal and family concerns. In August 2006, a year after I graduated, I was baptized at the cathedral by Bishop Christodoulos with the assistance of Fr. Theodore Giannakopoulos. While in seminary, we were required to write a thesis for our Master’s program, and with all the research I had invested in the Old Calendarist Orthodox Christians, I decided to write my thesis on Metropolitan Petros and his work to establish and support the Old Calendar church in America. I enjoyed researching and writing the thesis greatly, and was given access to important documents that many had never had the chance to see. The present work was originally submitted as a thesis to the faculty of St. Vladimir’s Seminary on April 20, 2005, and has now been revised for publication. I would like to thank all those who have supported me over the years and I pray that my publication of this work on the life of Metropolitan Petros will help to further raise awareness of the Church of the Genuine Orthodox Christians of America.